Preclusive Effect of TTAB Decisions: Always, sometimes, or never? Last week a divided Eighth Circuit panel affirmed a district court’s conclusion that a TTAB decision would not be given preclusive effect in B&B Hardware, Inc. v. Hargis Industries, Inc. 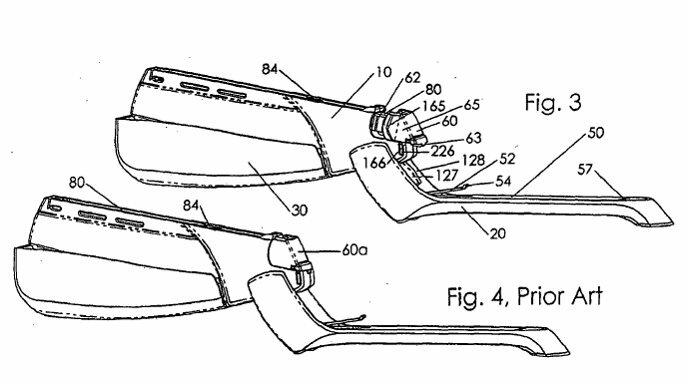 The court reasoned that preclusion was inappropriate because the TTAB decided different likelihood-of-confusion issues that those that were before the district court. Comments Off on Preclusive Effect of TTAB Decisions: Always, sometimes, or never? Supreme Court: Already v. Nike is Moot. Sometimes a party who is sued will voluntarily cease its objectionable conduct to end the lawsuit. That cessation, however, does not automatically moot the other party’s claim. City of Mesquite v. Aladdin’s Castle, Inc., 455 U.S. 283 (1982). The “voluntary cessation doctrine” is, effectively, a presumption against mootness in these cases. The doctrine holds that the case is not moot unless the wrongful conduct “could not reasonably be expected to recur.” Friends of the Earth, Inc. v. Laidlaw Environmental Services (TOC), Inc., 528 U.S. 167 (2000). Already, LLC v. Nike Inc., 586 U.S. __, No. 11-982, 2013 WL 85300, *6. IntellectualIP previously wrote about the cert grant. Comments Off on Supreme Court: Already v. Nike is Moot. Both parties have appealed and have raised many—too many—issues. 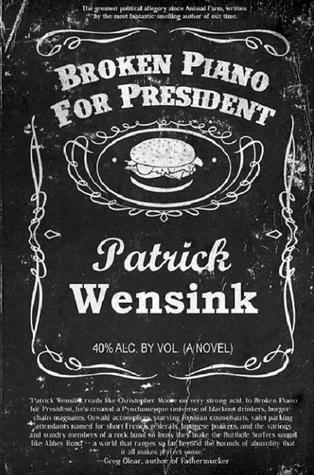 Broken Piano for President is a blog and eponymous book by Patrick Wensink. The book’s cover, at left , bears a resemblance to the label on a bottle of Jack Daniels Whiskey. 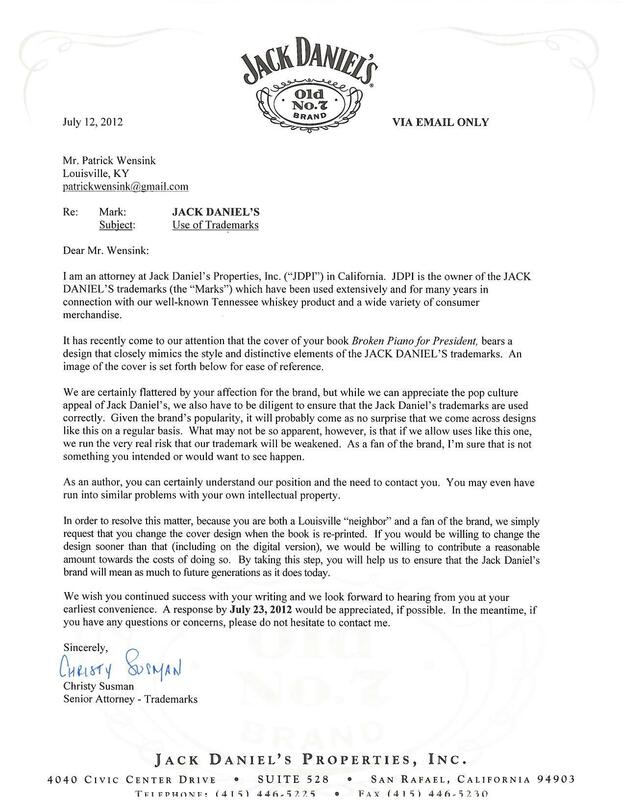 Jack Daniels Properties, Inc., sent a cease-and-desist letter to Wensing, at right. The letter is remarkable for its tone. It’s a remarkably nice C&D letter. [O]nce a trademark owner loses control of its mark by failing zealously to watch over its use by others — or by not objecting to its unauthorized use — the reputation associated with the mark is reduced. C&D letters aren’t sent for the sake of more litigation. They are sent because mark-holders who don’t send them tend to weaken or lose rights in their mark. Mark owners can use such letters in later litigation to help demonstrate that they actively police unauthorized uses in their marks.